The other night I sat at my computer from 9pm to 1am, taking part in a frenetic and difficult Buffy The Vampire Slayer quiz in the Buffy/Angel/Whedonverse group on Facebook. Some 50 people started the quiz and maybe 25 were still at it by the end. It was aggravating and frustrating. I missed some questions just because I couldn’t reload the page fast enough, and I missed a couple others because I went too fast & made mistakes. All I wanted was to make it into the top ten. But it turned out they only posted the top three. But I got third place! Yay me! The admin made me my choice of collage as a prize. I chose Willow and Tara, my favorite couple on Buffy. Congratulations, me! This blog can now be found at the very easy-to-remember www.thejosswhedonfanclub.com. Now I will get accidental traffic from people looking for an actual Joss Whedon fan club! But I actually am an actual fan club, I just happen to have a membership of one (me.) I meet in private by myself and then report back on this blog. 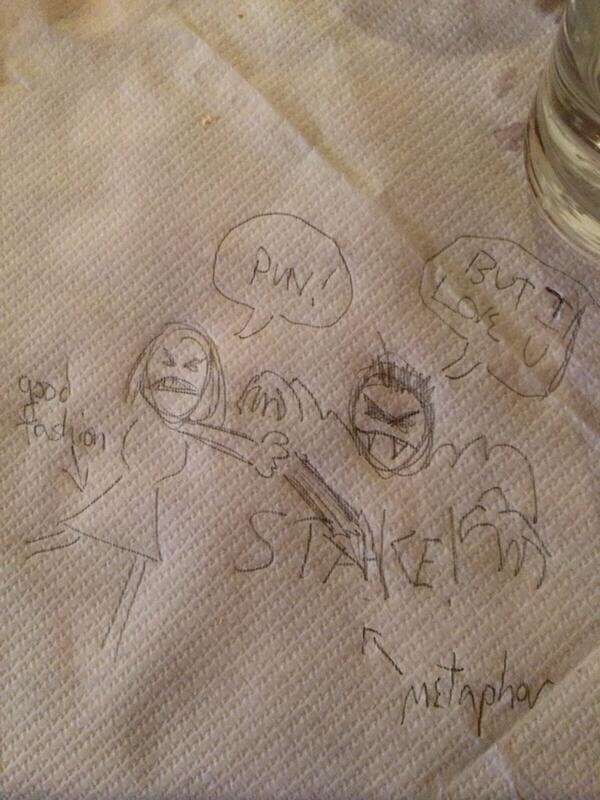 The big event of this week was Joss Whedon’s Napkinpalooza, wherein he added to the official Buffy canon with a scribbled drawing on a napkin, just because a fan on Twitter asked for more Buffy. Then he went and did the same thing for Firefly. The other thing I didn’t really bother to look into, but it had something to do with officially approving Marvel’s changing Thor into a woman. Don’t ask me. I don’t care much about Marvel and I’m just patiently waiting for Joss to be done with them. Joss does have some fans who are not into the Super Hero thing!!! Such as me. So I don’t really care what happens in the Marvelverse. They have lost me as of Guardians of the Galaxy. More on that later, maybe. Suffice it to say I think the movie really glorified guns & weaponry. Also, it was formulaic and shallow. This is a funny joke. Who’s up for an old fashioned sing-a-long? 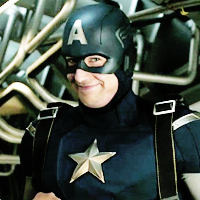 Joss Whedon has revealed that Avengers 2: Age of Ultron will be a musical. The main cast have spent months training with choreographers and singing coaches to perform original numbers penned by Whedon and his brother Jed. Early reports suggest that songs include a duet for Black Widow and Hawkeye entitled Summer in Budapest, a Capatin America swing solo called The A Don’t Stand For France and Eurorock spectacular Bring the Hammer Down performed by Thor. I’m not as insane as I look! Sometimes I feel very alone in the world, at least in terms of my Joss Whedon obsession. But then once in a while something comes along to justify my rabid, insane fandom. Like this article! I really wish I could get a PhD in Buffy Studies (such a thing exists, you know) but it would actually take a lot of work and I have other things that need doing. So it’s just a fantasy. One place I hang out in order to not feel alone is the Buffy the Vampire Slayer group on Facebook. People waste away their days there, just talking about Buffy! I love it. Except there are some apunctual repeat offenders there who kind of drive me insane. And then I am just as insane as I look. But it’s not just me who’s off my rocker, it’s all of us, because in reality we are not off our rockers at all! There are thousands upon thousands of us rabid fans, and we just happen to know about Buffy. I defy anyone to actually watch all of Buffy and still not get it. Buffy really is that amazing. 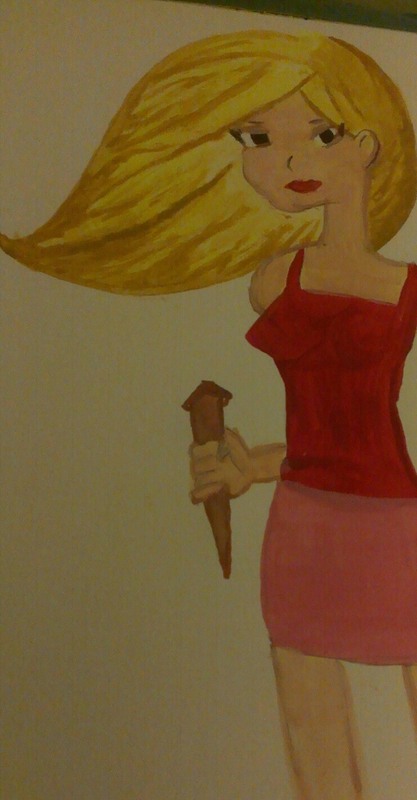 I came across this fan who says she doesn’t usually paint, but this portrait of Buffy just came out of her one day. Her name is Tess Smith. I love this painting! I love it a million times more than when people just post photos. This is something she created herself, which hardly anyone bothers to do anymore. Hurray for fan art! I have a painting too. I had it commissioned some seven or eight years ago. 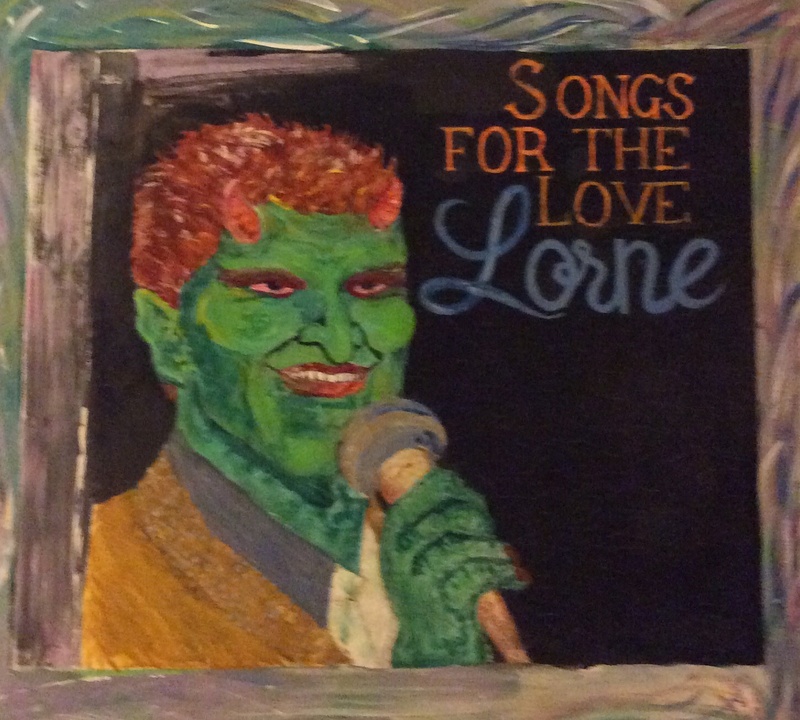 If you don’t recognize him, this is “Lorne” from Angel. But rare is the visitor who knows who he is. Sad, sad. It’s been 20 years since I first saw the movie Speed and was completely surprised by how good it was. I’m not usually one for the action movie. Too much action. But Speed was good. What made it so good? Well back then I didn’t know the name Joss Whedon, nor did most people. And it wouldn’t have mattered if we did, because he got written out of the credits after re-writing all of the dialogue in the movie and making insane things make sense. 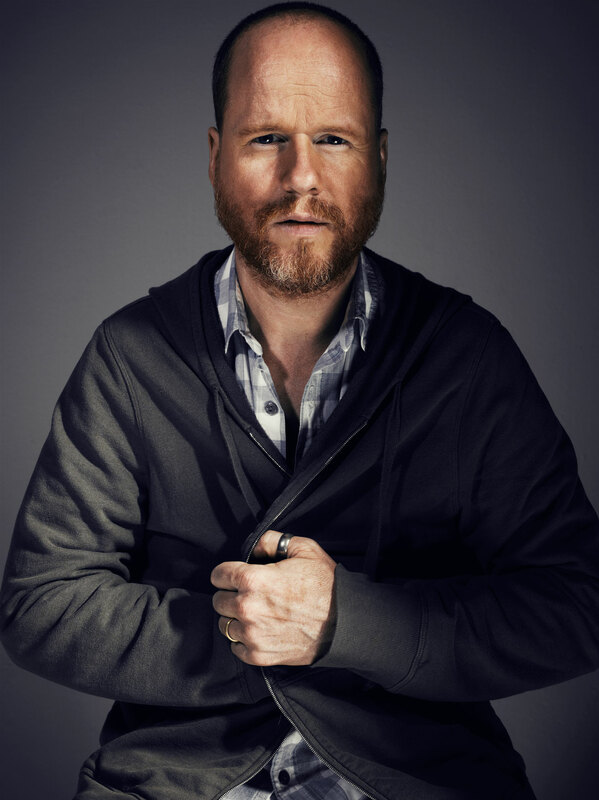 Here is a really good interview with Joss, about how he was “pretty devastated” by getting written out of the credits, and he talks about the work he did on Speed. It’s very interesting and also sad. In other news. Christophe Beck wants to score a(nother) Marvel movie. Wait, who is Christophe Beck? He’s the musical wizard who scored Buffy, and that score was awesome (not including Season 1 which was someone else’s fault.) I have been consistently disappointed by Bear McCreary‘s score for Marvel’s Agents of S.H.I.E.L.D., and have often wished that it was instead scored by Christophe Beck. I think he is what the show is lacking. In any case, it would be neat if he and Joss worked together on The Avengers III, but I am hoping that Joss won’t agree to do the third Avengers. He has too many other things that need his attention, not the least Agents of S.H.I.E.L.D.. That is where Christophe Beck and Joss Whedon should be reuniting.